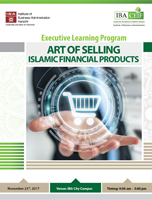 IBA Centre for Excellence is offering a unique intermediate level one day course on the art of Marketing and Selling Islamic Financial Products. The course will enhance the understanding of the market for Islamic Financial Products. The course is designed to discourse to the participants the "Dos and Don'ts" of dealing with the customer, keeping in mind the sensitivity of the product association with religion. The trainer will also enrich the classroom discussions with universal practices and cases enabling the participants to gain insight into the minds of the consumer and gain a competitive edge. Assistant Professor Dr Ziyaad Mahomed is a faculty member at INCEIF. He is the Chairman of the Shariah Board of HSBC Amanah Malaysia and serves on a number of Shariah boards internationally. He is a registered Shariah Advisor at the Maldives Monetary Authority and Bank Negara Malaysia. A multi-award-winning Scholar with almost 20 years of global experience as an Executive, Consultant and Islamic Scholar, Dr Ziyaad has experience in almost all sectors of Islamic finance including sukuk, regulatory frameworks, takaful modelling, private equity fund structuring and risk management. Dr Ziyaad has consulted/trained more than 7,000 Finance Professionals and Islamic Scholars in most disciplines within the Islamic Finance sector in Africa, Europe and the Middle East. He is a recipient of Lifetime achievement award for his 20 years of contribution to the development in the field in Africa.